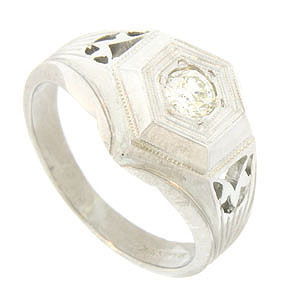 A round fiery diamond is set into the face of this 14K white gold antique ring. 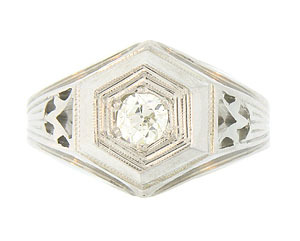 The face of the ring is six sided and decorated with radiating frames of distinctive milgrain design. 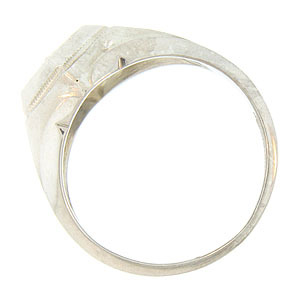 A bold organic cutout adorns the rings shoulders while radiating engraved lines drape down the sides of the band. 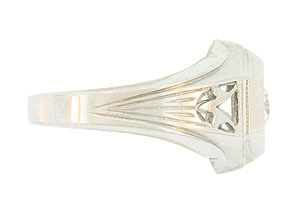 The Art Deco ring measures 13.60 mm in width. Circa: 1920. Size 7 3/4. We can re-size.